. . .They let the first blind, occupied by the shack, go by, and jumped on the second and third blinds. Of course, the shack jumped off the first and on to the second as it went by, and scrambled around there, throwing off the men who had boarded it. But the point is that I was so far ahead that when the first blind came opposite me, the shack had already left it and was tangled up with the tramps on the second blind. A half dozen of the more skilful tramps, who had run far enough ahead, made the first blind, too. Not your typical Jack London tale but very interesting and entertaining. It's about his life on the road and his experiences riding the rails as a hobo. A series of anecdotal tales of dodging conductors, railroad security, town sheriffs, and bumming meals while perfecting the art of lying. 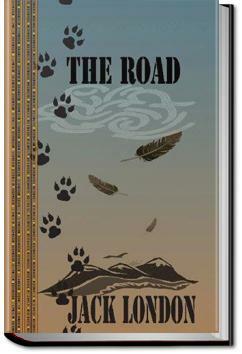 The Road by Jack London was published in 1907, years before George Orwell’s Down and Out in Paris and London and decades before Jack Kerouac’s On the Road. Has to be by far one of the most interesting Non-fiction travel stories I have read. A classic needless to say; makes you want to jump on trains and travel across the US or the world for that matter. Ein Schlitzohr mit Erzähltalent über das unerträgliche Vergnügen, ein Schwarzfahrer und Schnorrer zu sein. This is The Road before On the Road. It's funny and ugly and individualistic and crafty and bad and good and American and human. I can't imagine what it's like to be so far over the edge, and then to come back.